Investors should expect the recent uptick in whole-company takeovers by energy-focused master limited partnerships (MLP) to continue in coming years. This article examines the factors driving this trend and highlights a handful of potential takeover targets. 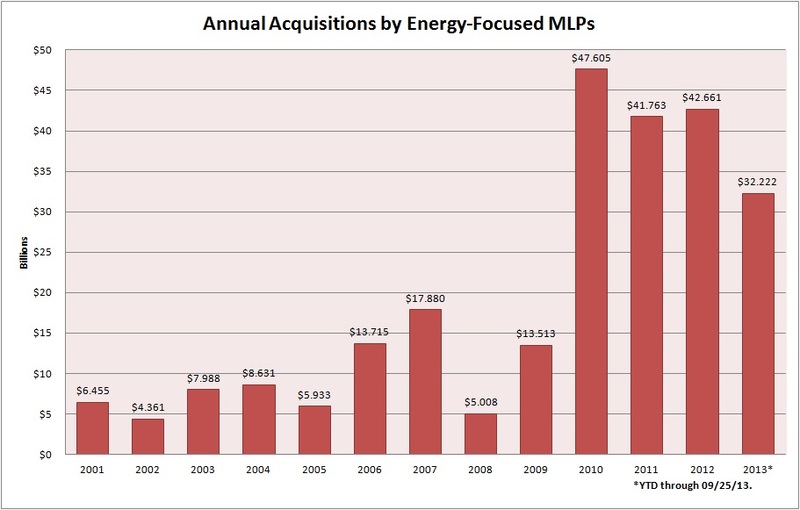 Over the past decade, the current universe of energy-focused master limited partnerships (MLP) has closed 689 acquisitions–a total value of $236.9 billion. Deal flow has been particularly robust over the past three years, reaching a record $47.6 billion in 2010. With $32.2 billion worth of transactions announced thus far in 2013, these roughly 100 publicly traded partnerships appear on pace to match last year’s total. At the same time, the average value of these acquisitions has also increased significantly, peaking at $507 million in 2010. These trends in deal volumes and prices reflect a confluence of salutary factors. The shale-oil and -gas revolution has led to an upsurge in US hydrocarbon production that overwhelmed existing midstream infrastructure (pipelines and processing), increasing the value of existing assets and prompting many private-equity outfits to seek to monetize their holdings. At the same time, the Federal Reserve’s commitment to keeping interest rates near zero and quantitative easing have dramatically lowered MLPs’ cost of capital in the equity and bond markets. Low borrowing costs, coupled with a huge opportunity set, have contributed to the upsurge in acquisitions. Although the types of assets acquired by publicly traded partnerships haven’t changed–pipelines and producing acreage still predominate–the past few years have brought an uptick in whole-company takeovers, including several acquisitions of fellow MLPs. We’ve also seen an uptick in private-equity outfits acquiring general-partner interests in smaller, struggling MLPs to serve as a vehicle for monetizing their midstream assets. Note that this table omits the 2008-10 upsurge in MLPs buying out their publicly traded general partners to lower their cost of capital and improve their competitiveness. (We discussed this trend at length in Profit from General Knowledge.) We also included Kinder Morgan Inc.’s (NYSE: KMI) fall 2011 acquisition of El Paso, as the general partner ultimately plans to drop down all these assets to El Paso Pipeline Partners LP (NYSE: EPB) and Kinder Morgan Energy Partners LP (NYSE: KMP). Linn Energy LLC’s (NSDQ: LINE) proposed acquisition of Berry Petroleum (NYSE: BRY) via an innovative transaction that uses shares of LinnCo LLC (NSDQ: LNCO) as currency for the deal also makes our list. However, recent action in the involved parties’ stock prices suggests that this acquisition is unlikely to close; the announced deal premium of 28.4 percent has shrunk to a discount of 15.4 percent. We see two important takeaways for investors from the recent increase in takeovers of publicly traded companies in the MLP space. First and foremost, the most active acquirers on our list tend to be larger-capitalization names that have the scope to complete these deals. Kinder Morgan Energy Partners, for example, is the second largest publicly traded partnership by market cap, while Energy Transfer Partners LP (NYSE: ETP) ranks third and Williams Partners LP (NYSE: WPZ) holds down the fourth position. These MLPs also face a bigger hurdle to grow their quarterly payouts by a meaningful percentage, thanks to the size of their existing operations and the burdensome incentive distribution rights that they pay to their general partners. Check out this table detailing the extent to which the five largest MLPs must grow their cash flow to increase their quarterly distributions by 10 percent. To provide perspective, we’ve also included data for EQT Midstream Partners LP (NYSE: EQM), an MLP that went public in June 2012. Kinder Morgan Energy Partners, for example, must produce 59 times as much incremental cash flow as EQT Midstream Partners to support a 10 percent hike to its quarterly payout. 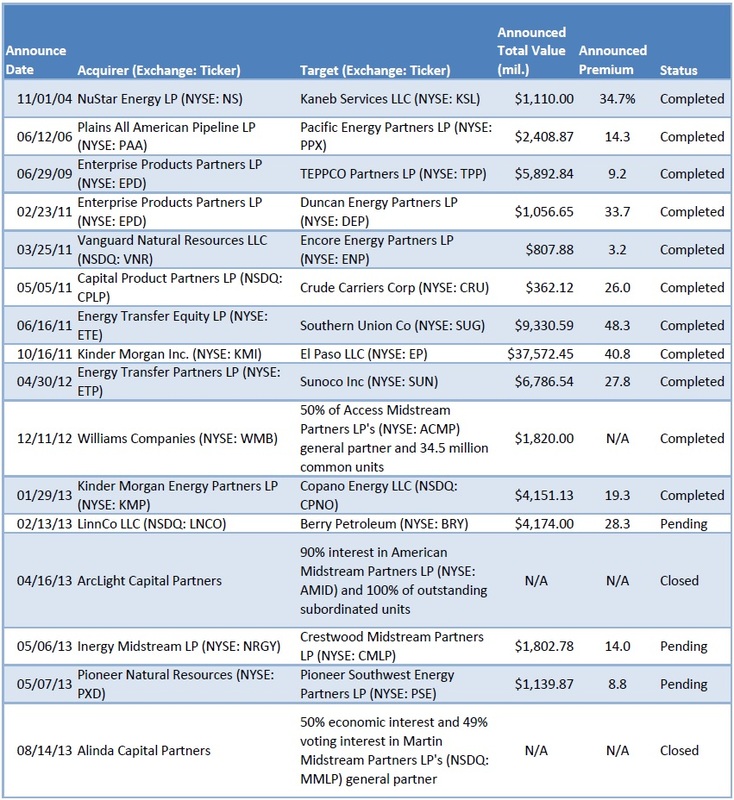 Perhaps in recognition of these hurdles, the general partners to Kinder Morgan Energy Partners, Energy Transfer Partners and Williams Partners–Kinder Morgan Inc., Energy Transfer Equity LP (NYSE: ETE) and Williams Companies (NYSE: WMB)–have used acquisitions to diversify the limited partners under their umbrellas. Let’s turn our attention to Inergy Midstream LP (NYSE: NRGM) and its general partner, Inergy LP (NYSE: NRGY), which in early May announced a complex merger with Crestwood Midstream Partners LP (NYSE: CMLP). The combined MLP will boast impressive diversity in terms of its operations, geographic footprint and customer base, while the increased scale should lead to an improved credit rating and access to capital. Given the lack of overlap between the two MLPs’ operating platforms, only $15 million to $20 million in synergies are expected. After the merger, about 51 percent of Inergy Midstream’s gross margin will come from take-or-pay contracts, while fixed-fee arrangements will account for about 33 percent. After our announcement, you may have observed that a number of small to mid-cap, midstream MLP’s are now aggressively searching for a merger partner. It’s clear to us that size does matter in this business, as the projects seem to just get larger and larger. So sector consolidation is certainly well underway right now. Although management teams within the MLP space have been coy about their efforts to partner up with other industry participants, analysts took advantage of NuStar Energy LP’s (NYSE: NS) Investor Day to ask executives whether the firm would consider a merger with another partnership. 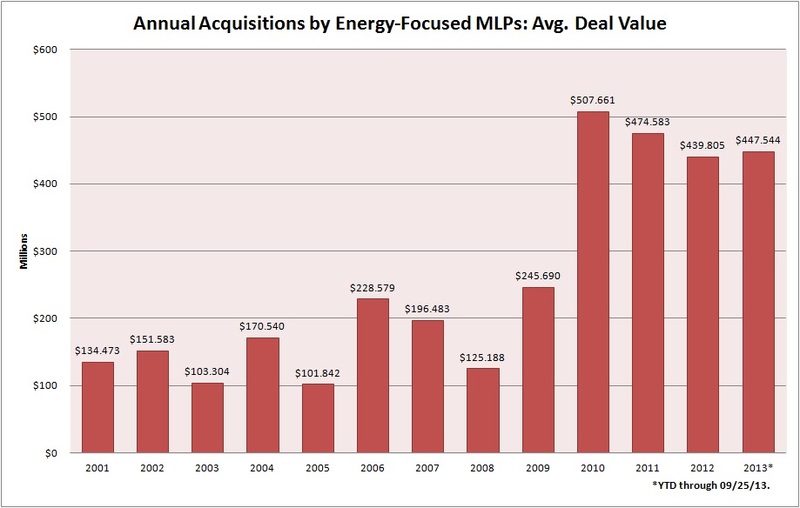 The past six months have also brought an uptick in private-equity outfits acquiring general-partner interests in smaller MLPs to serve as a vehicle for monetizing their midstream assets via drop-down transactions. These deals have proved to be major upside catalysts for the associated limited partners. Units of American Midstream Partners LP (NYSE: AMID), for example, have returned 33 percent since ArcLight Capital Partners announced the acquisition of a 90 percent interest in the MLP’s general partner. Likewise, Martin Midstream Partners LP’s (NSDQ: MMLP) stock has rallied by 10.5 percent since Alinda Capital Partners disclosed that it had acquired a 50 percent economic interest in the MLP’s general partner. Management teams from the Energy Transfer family of companies have indicated that Energy Transfer Partners and Regency Energy Partners eventually could merge, but have avoided articulating a time frame for this combination to occur. Kinder Morgan Inc.’s executives have made similar statements about Kinder Morgan Energy Partners and El Paso Pipeline Partners, though Chief Operating Officer Steven Kean talked down this course of action at the Barclays CEO Energy-Power Conference. Kinder Morgan Energy Partners’ recent acquisition of Copano Energy LLC (NSDQ: CPNO), the firm’s partner in the Eagle Ford Gathering joint venture, refocused investor and analysts’ attention on the potential for similar deals. Investors have long speculated Markwest Energy Partners LP (NYSE: MWE) could be a takeover target for a larger MLP seeking a foothold in the Marcellus Shale; this rumor gained some legs after the MLP recently announced a potential joint venture with Kinder Morgan Energy Partners, a name that has relied heavily on acquisitions to drive growth. This joint venture would develop midstream infrastructure to handle natural gas and natural gas liquids (NGL) produced in the Ohio portion of the Utica Shale. NGLs are a group of heavier hydrocarbons that includes ethane, propane and butane–the building blocks of many plastics and synthetic materials. The projects contemplated by this agreement include a gas-processing plant with a nameplate capacity of 200 million cubic feet per day. MarkWest Energy Partners’ management team has indicated that the site could accommodate up to four additional processing plants of the same size. Another possible takeover target: TransMontaigne Partners LP (NYSE: TLP), which participates with Kinder Morgan Energy Partners in the Battleground Oil Specialty Terminal Company (BOSTCO). The first phase of this facility, an oil-storage terminal on the Gulf Coast that stands to benefit from growing US exports of petroleum products, is slated to come onstream in the fourth quarter of 2013. Not only did Kinder Morgan Energy Partners’ management team highlight BOSTCO as a promising growth opportunity in a conference call to discuss the MLP’s second-quarter results, but TransMontaigne Partners’ general partner, Morgan Stanley (NYSE: MS), also could be motivated to sell because of regulatory uncertainty. As for MLPs that might receive a boost from a private-equity outfit, PVR Partners LP (NYSE: PVR) and Eagle Rock Energy Partners LP (NSDQ: EROC) could fit the bill. PVR Partners has struggled to deliver on promised growth since the MLP diversified away from its ailing coal royalties business by acquiring midstream assets in the Marcellus Shale. Although the market initially cheered the move, throughput on these systems in the northeastern portion of the Marcellus Shale hasn’t lived up to expectations and distribution coverage has been spotty. Eagle Rock Energy Partners, which operates upstream and gathering and processing assets in the MidContinent region, has struggled to cover its distribution because of its exposure to weak ethane and propane prices. During the MLP’s recent earnings calls, analysts have asked whether management had considered alternative strategies to shore up its balance sheet. American Midstream Partners is another potential takeover target. The small-cap MLP’s struggles to bridge the gap between its cash flow and its distribution continued into the second quarter, with the firm’s cash flow only covering only 48 percent of its payout. But thanks to the intervention of High Point Infrastructure Partners LLC–a portfolio company of private-equity outfit ArcLight Capital Partners LLC–the hapless partnership’s future appears brighter. Since High Point Infrastructure Partners acquired a 90 percent interest in American Midstream Partners’ general partner, the new sponsor has made a number of changes that prompted management to forecast a 3 percent to 5 percent distribution increase for the third quarter. First, this transaction included the contribution of High Point Infrastructure Partners’ operating assets, which include approximately 700 miles of onshore and offshore gathering and transmission assets that serve producers on the Gulf Coast. Management expects these assets to add $10 million to $12 million in annual earnings before interest, taxes, depreciation and amortization (EBITDA) and estimates that the combination in 2014 will produce $1 million to $2 million in cost synergies. Equally important, American Midstream Partners and ArcLight Capital Partners announced an agreement whereby the outstanding subordinated units and incentive distribution rights were restructured, effectively boosting the MLP’s expected distribution coverage to about 1.3 times to 1.4 times cash flow. This new structure also incentivizes ArcLight Capital Partners and High Point Infrastructure Partners to drive distribution growth through additional drop-down transactions. During a conference call to discuss second-quarter results, American Midstream Partners’ management indicated that such a deal could occur in the fourth quarter of 2013 or early 2014. We’re also bullish on the MLP’s construction of a gathering system in the oil-rich window of the Eagle Ford Shale; this growth project, which is slated to come onstream in 2014, is backed by a long-term, fee-based agreement. 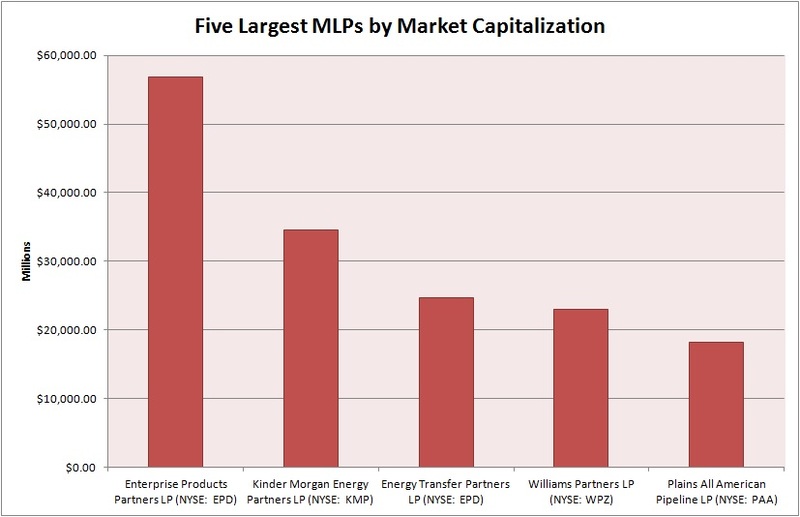 American Midstream Partners eventually could be absorbed by Enable Midstream Partners LP, a larger MLP that will house midstream assets owned by CenterPoint Energy (NYSE: CNP), OGE Energy Corp (NYSE: OGE) and ArcLight Capital Partners. Although this privately held MLP’s S-1 registration statement with the US Securities and Exchange Commission has yet to enter the public domain, the parent companies have indicated that the initial public offering would take place in late 2013 or early 2014.